As a professional diviner and priest of the Gods, I read for clients and co-religionists on a regular basis, but struggle to find time to seek out divination for myself. I was blessed to get a reading from Monica at a psychic fair we were both working. The spirits came through strong and her advice was poignant, lucid and necessary. Implementing the subtle shifts she recommended was hugely impactful to my spiritual life. I've been integrating and implementing for months now and keep returning to her words. I highly recommend her divination services and am immensely grateful to her and her spirit guides. ​My experience with Monica was deeply touching and incredibly profound. There is much to say. Pragmatically the rituals suggested were doable, supportive and healing. Aesthetically I was moved to misty eyes on more than one occasion during the session. Spiritually I found myself transported to a precious and sacred moment that reminded me of something both primal and transcendent—the words that come to mind are holy, sacred and relational. Monica is a skilled and compassionate diviner infused with grace and feminine power who holds a container that is palpably infused with love, priestessly-care and the well-polished mirror-mind of one who ‘walks their talk.’ I am so grateful I gave myself the gift of a session with her, and to have received her sacred gifts and talents during a time of great inner questioning. One thing I noticed after our time together is I was funnier than usual and felt a wildness... both of which I associate with the spirit world! A vitality that brings forth deep, deep laughter! In that way I feel the authenticity of your work. Thank you for sharing it with me. Monica is gifted. Her divination was a flowing fountain of information and insights, captured in a recording so I could listen again and work with them in my journal. She carries the relationships with the unseen with ease and integrity, assurance and skill. There is profound wisdom in this work. I am still integrating the deep riches that I received into actions and choices in my life. Thank you Monica. I highly recommend you to others. I feel a significant and delightful change of course in my life from your reading. Literally, much more freedom and fun in where I choose to travel and live! Clarity that I can harness the whirlwind of my life and call in what is needed to do the work I choose to do, and a growing confidence to do it. I am now embarking on a profound adventure I did not expect! You and the Spirits were in touch with issues I am working with, and brought in new things as well. Your assessments of my situation were accurate. You made me aware of ways I am in resistance. I have opened up to my relationships with my ancestors, and am beginning to bring them into my consciousness and activities. I am feeling love and wise support I didn't know was there. I love the way you showed me to hold up my arms to feel and define my boundaries! I can use this to help me with this very huge issue in my life on all levels. At the end, the Spirits spoke to me like no one else has, of things that are near and dear to my heart. They gave me a great gift of being seen. As I was tapped into all this love and knowing of myself, they had me give it a shape and anchor it into my body, so I can turn to it, have it with me, at all times. What a great companion and resource! I am so grateful for this experience. It is really moving through me. I've no words for the tremendous healing that's happened overnight. It's almost unbelievable and if I didn't trust in Spirit as much as I do I wouldn't believe today is real. Your work is truly invaluable. Immense gratitude to you today, sister. While I have had sessions with other divination sessions from this lineage before, this was beyond what I have experienced in the past. Monica accesses levels of intuition and other beings that I had never come into contact with before. The sessions was incredibly insightful and helped me move through several blocks that were in my way with my business and relationships. 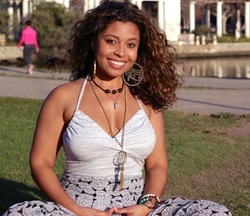 I recommend Monica for anyone who wants to come into a new relationship with elemental beings, ancestors, and beyond. ​Working with Monica and the kontomble was a deeply moving experience. Monica prepared me for this profound meeting, which made me feel held, and then I felt seen and heard and guided in a way that has continued to unfold in my life long after the divination. Thank you, Monica! I came to Monica in need of guidance towards an important decision I was about to make. This was my first divination, and she greeted me with kindness and warmth, which quelled much of my anxiety about having one. I found the divination to be very helpful, interesting, and exciting. Monica helped open a doorway of connection with greater forces that are alive around me. I received a voice divination from Monica three months ago. The session itself was very fun, enchanting, fascinating, and had a lighthearted humorous tone while also managing to address deep and complex issues in my life. Monica touched on some things that I had suspected but wasn't sure about and it was wonderful to receive external confirmation/validation. She also provided new insight and perspective on some things I hadn't been able to see or consider previously. I emerged feeling lighter and more hopeful in general. She (and the team she works with, so to speak) were a delight and definitely beneficial and I would absolutely recommend her services to anyone who could use some clarity on their path. Monica is deeply intuitive. I was referred to Monica for her to help conduct a ritual. As soon as I met with her she lasered into what I was unconsciously carrying into our session. She guided me with strength, encouragement, a sense of confidence and deep connection to herself, and gentleness. During the ritual there were moments that felt surreal to me, and I am pleased to say that with time I have felt a sense of renewal that I think is definitely linked with the carrying out of the ritual. Thank you Monica for your ability to go deep, and for you holding the space to let me go deeply so I could experience a new layer and level of healing. May the blessings be. Ase! My experience with Monica was genuinely moving and profound. She was able to tap into and share wisdom that deeply resonated with me. She was present, compassionate, intuitive, and professional throughout the entire session. I have already found personal clarity and healing from important information that came through the divination. I would see her again and recommend her to anyone looking for guidance in any area of life. I have received two voice divinations from Monica, and both have been deeply transformative experiences. The space that Monica holds while she channels messages from the dear Kontomble is beautiful. Monica embodies a deep well of compassion as well as a clarity of truth while speaking messages meant to transform. Over the years that I have known Monica, her presence has inspired, comforted, and lightened me in every interaction. Here is a being who carries deep respect for the sacred in the way that she walks in the world. Divination with her is a powerful experience that I recommend to any seeker. Monica is tapped into that well of wisdom from the otherworld. She is an open channel who will lovingly tell you what you need to hear, in beautiful soft languages and images. Her gifts as a poet are obvious as she translates the messages of spirit. My divination with Monica marked a transition for me away from an unhealthy pattern I had been stuck in for a long time. It kind of just lost its hold on me! Come to Monica when you are ready to hear the truth, be held, and move forward with your life. Through divination Monica takes you on a journey, through a story, through your story. I came to the divination with a specific question in mind and the question evolved and deepened. Monica was able to notice many more aspects and subtle qualities about my life-path and circumstances during the divination, seeing the various strands and weaving them together using the elements, ancestors, and spirits. I came away with a greater understanding of the immense support system from the Otherworld that is always with me, guiding me, and what I could do to strengthen these connections in order to walk in the world straighter, surer of myself and my path. She was able to tap into the root of the issue that I was facing in my life, and provided gentle guidance through recommended rituals that helped me step more fully into part of my magic and power. My feeling during the divination was that of being held in a sacred space while waves of wisdom and insight came through, touching me deeply. The ripples from the divination experience were felt long after the reading was over: some are still shimmering through. Monica creates a beautiful, sacred space for gaining insight into and guidance towards her clients’ healing journey. The divination that I received from Monica continues to resonate and teach. I was not sure what to expect when we met, but I quickly felt safe and at ease. I came with a question and a need for guidance on the path of relationship. I asked for a ritual to help me deepen intimacy and step more fully into my dream of creating family. Monica's intuition and connection to the spirit world came through during the reading, and I left with clear guidance for what I needed to do for my intention to unfold. Just recently, many months after the divination, a piece of what Monica shared with me became clear. I am amazed at the longterm impact of what was begun the day that we met, and the clear vision that Monica had for my future. Monica’s divination played a crucial role in my housing search. After living in the same home for many years, I found myself needing to move, under stressful circumstances. The question I took into the divination was how to find a new home with a joyful and supportive environment. Monica’s divination went deeper than just my housing search: she made me aware of patterns in my life that were blocking me from creating what I want. It has been extremely helpful being aware of these patterns! The divination also brought me into a closer connection with my ancestors. As for the housing search, soon after doing the rituals suggested by Monica, I moved into a living situation that is even better than I was imagining at the time. Experiencing a divination with Monica was just beautiful, and very enriching from a personal point of view. Monica is an excellent reader, and was able to tell me things about myself that were important to hear and acknowledge. She also helped create flow in my relationships with Mother Nature, the spirit world, and money. After performing the rituals she suggested, I felt my being grow lighter and happier. With passing time, I realize even more what precious help this reading gave towards my evolution and in dealing with challenges I am now facing in my life.